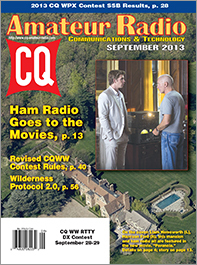 Our cover story for the September issue of CQ is about ham radio's role in the new Harrison Ford thriller, "Paranoia," which was released in mid-August. Ford's character is a ham and Bob Schenck, N2OO, tells the "backstory" of helping to provide equipment and advice for the movie scene in which ham radio is featured. Bob's article is titled, "Ham Radio Goes to the Movies." Next, we wrap up K0DQ's article on building a contesting "battleship" in the woods of New Hampshire with Part II of "Battleship New Hampshire: The Battleship at Sea." We also have a profile ofNewsline Young Ham of the Year Padraig Lysandrou, KC9UUS. CQ is a corporate sponsor of the award and presented Pat with a week at Space Camp as part of the award ceremonies in mid-August at the Huntsville Hamfest in Alabama. Continuing our realignment of contest reporting, we have results of this past March's SSB weekend of the CQ WPX Contest, and continuing our transition of the complete scores to the web, you'll find the complete score listing here and not in the magazine. Participation continues to climb, with a record number of logs received, despite the contest falling on Easter weekend this year. Contest Director N4TZ highlights several stories of contesters making a family activity of the WPX contest. Nine new records were set, and winners include: CN2R, NH6V, YW2LV, CR3A, P40Z, VE3DZ, UN8GV, P33W, RF9C and D4C. Congratulations to all! September is the month that we publish the rules for the CQ World Wide DX Contest, and there have been some significant changes in the CQWW rules this year. The full rules are preceded by an explanation of the major changes by Contest Director K5ZD. The rules are also posted here on our website. We wrap up our features this month with the conclusion of WB4ZKA's two-part article on making the most of your solar panel in the field. Among our columns this month, Irwin Math, WA2NDM, shows you how to build your own SWR meter in "Math's Notes;" Public Service Editor Richard Fisher, KI6SN, continues a developing conversation on updating the Wilderness Protocol for hams and others relying on radio to get out word of emergencies from the backwoods where there is no cell phone coverage. 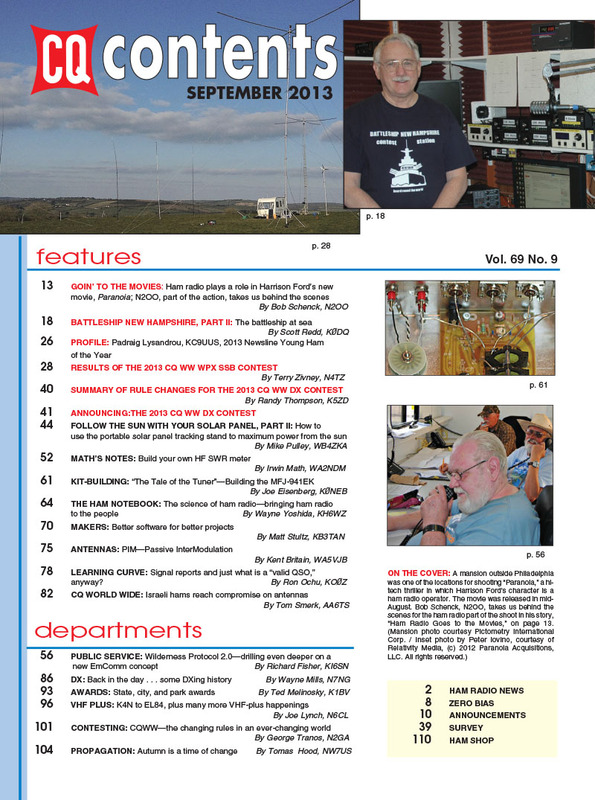 Kit-Building Editor Joe Eisenberg, K0NEB, takes us through the process of building the MFJ-941EK antenna tuner kit; "Ham Notebook" editor Wayne Yoshida, KH6WZ, discusses "The Science of Ham Radio" and bringing ham radio to the people in a science museum setting. "Makers" editor Matt Stultz, KB3TAN, introduces us to some open-source software that can help with designing and building various projects; Antennas Editor Kent Britain, WA5VJB, discusses passive intermodulation, or PIM; and "Learning Curve" editor Ron Ochu, KO0Z, examines what constitutes a "valid QSO." 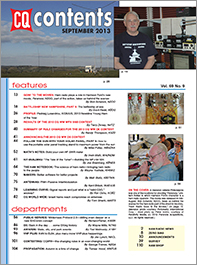 International Editor Tom Smerk, AA6TS, relays a report on the limited success of hams in Israel in dealing with antenna restrictions (getting approval for putting up simple wires or vertical antennas is now relatively easy, but towers and big beams remain nearly impossible to get OKd); DX Editor Wayne Mills, N7NG, looks back at the story of "one six-land DXer" and the lessons he's learned that can apply to us all, and Awards Editor Ted Melinosky, K1BV, checks out a variety of state, city and park awards. "VHF-Plus" editor Joe Lynch, N6CL, reports on a griDXpedition to rare grid EL84, as well as K7CW's hard-earned 6-meter DXCC from the Pacific Northwest. Contesting Editor George Tranos, N2GA, offers his take on the changes to the CQ World Wide Contest rules, and Propagation Editor Tomas Hood, NW7US, looks at the changes in propagation that come along with the changing of the seasons. That's a brief look at what's coming up in the September issue of CQ magazine, which should be on newsstands and in subscribers' mailboxes by early September, and available to digital subscribers as of September 1. For information on becoming a CQ subscriber, click here. Zero Bias - "Learning to Hear"
© Copyright 2015, CQ Communications, Inc. All rights reserved. This material may not be reproduced or republished, including posting to a website, in part or in whole, by any means, without the express written permission of the publisher, CQ Communications, Inc. Hyperlinks to this page are permitted.